Another half marathon has come and gone. This years Fools Run was a mirror image of the past 4 years I've attended. I'm always telling people what a great event this is. Teresa and Larry Nightingale contribute so much to the local running scene and are true role models to the way I believe a great running event should be put on. From the value of what you get to the organization which makes race day easy even with ferries and such. There should be a trophy given to best race at the end of the running series! This was my fifth year runnig this event and every year I feel as though I'm a different runner. Three weeks before this event my Girlfriend Sally and I were in a horrible car accident in Rogers Pass. We were inside a tunnel when the car slid on black ice and we crashed into a pillar. The car was written off but Sally and I escaped without a scratch or a bruise and a new found respect for life. As happy as I was to be alive, the incident was very traumatic and it created a great deal of financial and lifestyle stresses which drained me physically and mentally. This led to more than two key workouts being missed leading up to this event. I knew I was still fit but was unsure how well I could run compared to last year. There is a great deal of pride and respect that comes from being able to wear the bib #1. Along side that comes a lot of expectations. I'm always ready for a challenge but admittedly it's a bit intimidating. 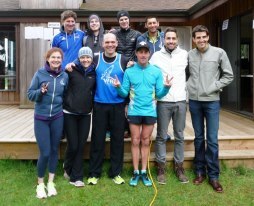 There were rumors that last years 2nd place runner and previous race winner Graeme Wilson would be returning. I also knew that fellow teammate Nic Browne was showing solid performances during practices and wouldn't go down without a hard fight. This was not going to be a cakewalk of a win. I'm glad that there is always someone for me to worry about here at this race as otherwise it would just be a glorified speed workout. After we toed the line and the gun went off, I ran from the start line in a relaxed manner. Within five seconds I noticed Nic blasting past me as if we were doing a 400 on the track. I was very surprised to see an attack right off the start line. I immediately responded and matched his pace. We rounded the first corner and the pace pressed on. I knew we were going quickly and I could feel it in my breathing. I was wondering if perhaps Nic was making a rookie move of going out too quick being it this was his first time on this course. I don't know Nic super well as he's a fairly new team member but I do know that be is very intelligent and an extremely talented runner. I know he studied the course elevation profile and between the first kilometer (3:13) and the mile, I knew his plan was to use the downhill during the first 4km to get as far ahead o me as he could. 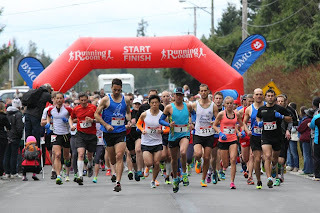 I know my fitness as well as this course and thought that I was working above my capacities if I had any hopes of staying strong through the hills in the last portion of the course. It was hard for me to let him go, but I thought I'd be able to catch him in the second half. By half way Nic had run out of sight. Usually I would have given up right there but I still had hopes as we had yet to hit Marlene's hill. That hill has nearly killed me before and I was ready to show Marlene who was boss today. At the water station before the hill a spectator said that Nic had 3:30 on me which hurt more than the upcoming hill. As I turned the corner to start the Marlene battle I could see Nic cresting the hill and I knew I still had a chance. I powered up Marlene like never before in hopes that Nic was running on fumes. After a few turns I realized that Nic had recovered and resumed his speed. Because of a distance miscalculation I thought I was still on par for a PB so I continued with a full effort. It wasn't until I reached the 18km marker (the second time! My fault) that I came to the reality that I had lost to Nic and was way off my personal best. I waivered between relaxing and pushing for the next kilometer until finally just saying screw it, you're almost there just give'er! 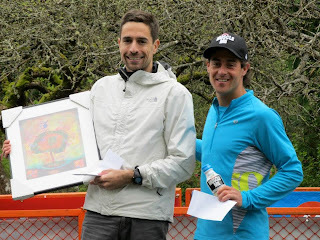 I was glad to be on the podium in one of my fave events but had a tought time on course all alone with what I thought was the toughest headwind of the five years I've done this race. After a warm down and some Delicious Muscle MLK to replenish my spent muscles, I went back onto the course to cheer in some more finishers. My friend Zahida was attempting to run a sub 2:00 and knew she would be coming in soon. When I caught up to her she was about 1k from the finish and suffering from severe calf cramping. I was worried her calf was going to get the best of her so I gave her the drill sergeant routine. I knew she was hating me at the time but she kept moving and as soon as she saw the finish she grew wings. Great perseverance as she just missed the two hour mark but still came in with a personal best. I may not have succeeded in completing my goals during this event, but to have helped one person to meet theirs was very satisfying. I'm glad to be able to inspire. I'm also glad to have runner who look up to me as they inspire me to stay strong and focused. I will now be religious with my diet and training as the next big race after the Vancouver Sun Run will be the BMO Vancouver Marathon. I will be ready for battle on both of those days! I love all the support I receive from the running community and am proud to be a part of this local scene. Thank you to my wonderful sponsors Pearl Izumi and Muscle MLK for providing me with the tools to stay healthy and strong and perform at my best! Happy training to you all! Stay fit and healthy and keep on running!